Nova mentored me through the whole process and it was she who suggested I include a princess with lovely red hair and freckles. Bridal fashion tends to feature mainly blondes and brunettes, and ginger-bashing is so socially acceptable that even Prince William seems to think it’s OK to insult his brother for being a redhead. It’s not OK Wills! You are adding the royal stamp to the misery of thousands of red-headed school kids. Finding models was actually the easiest part of the process. Tammy (Sleeping Beauty) and Sabbi (Rapunzel) were good friends of mine. Gifty (Snow White) worked in my local supermarket and Wendy (Cinderella) was a former Viva la Wedding customer. I was pretty nervous about approaching them. I felt almost as if I were asking them out on a date, but fortunately they were all keen to take part! I met Pamella Dunn, our venue stylist at a Wedding Industry Tweetup and instantly loved her style. When I called her to pitch the concept, she was incredibly enthusiastic and brought Aimee Akbar on board as hair and makeup artist. I could not have asked for a better styling team. 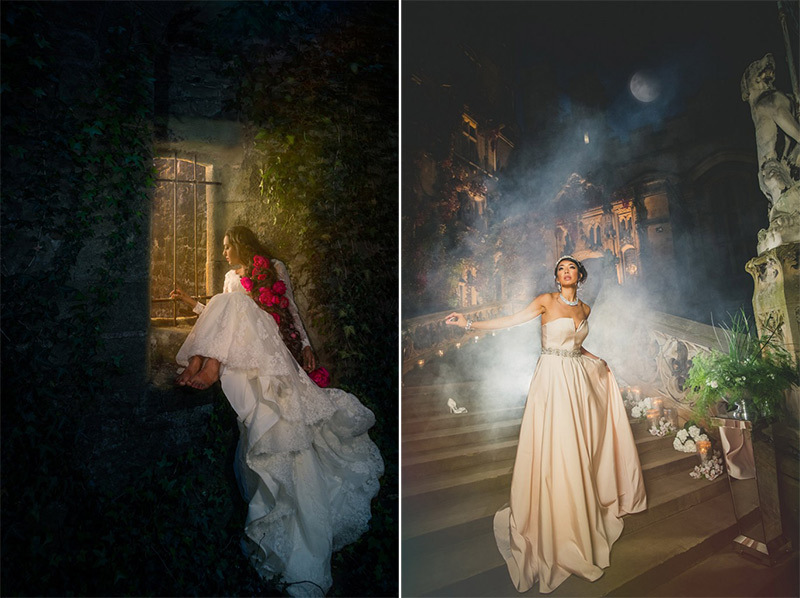 Pam and Aimee work instinctively, taking their inspiration from the model and the setting and the results really are magical! Pam knows her flowers so well and has wonderfully original ideas for dressing a scene. My favourite touch was the gold barbed wire she brought along for Sleeping Beauty to represent the forest of thorns surrounding the castle. Aimee really makes you understand why an MUA is called an artist. 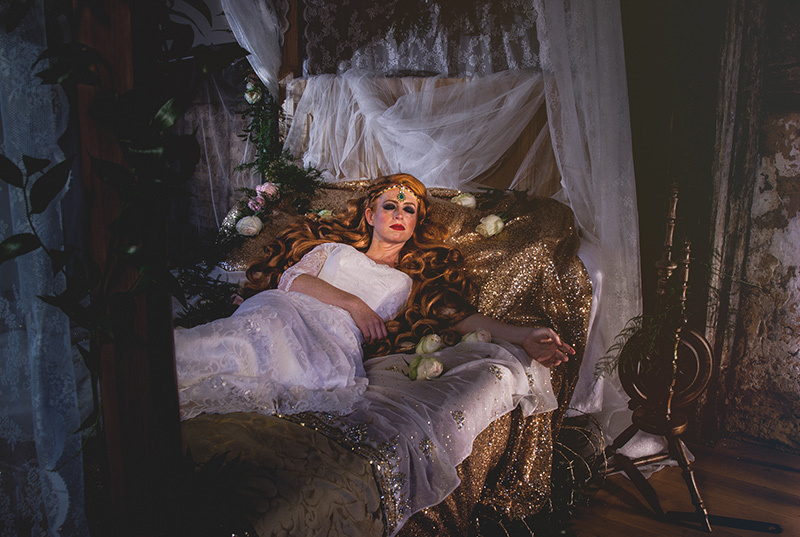 Her hair and makeup is phenomenally intricate, and really brings the wow factor to any shoot. At Viva la Wedding we cover a lot of Asian weddings and we find that Asian brides often have a civil ceremony where they wear a white wedding dress followed by a religious ceremony where they wear traditional costume. We photograph a lot of Asian brides wearing white dresses but with traditional henna designs on their hands and feet. 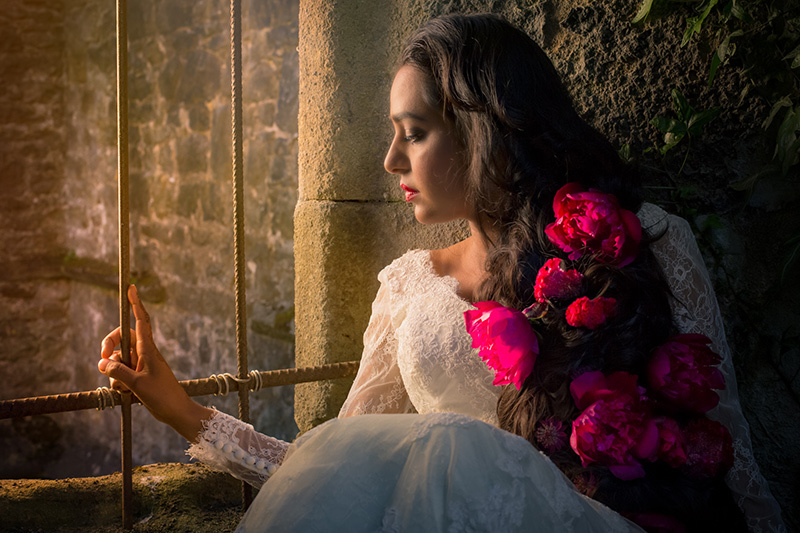 I think it’s a gorgeous combination so when it came to styling Sabbi as Rapunzel, I really wanted her to have some mehndi or henna patterns. Sabah at Beyond Henna was recommended to me by a local Facebook group, and she was kind enough to invite us to her house so that she could do Sabbi’s mehndi. It was a fascinating experience for me and amazing to see the skill and accuracy of Sabah’s work. I think it looks exquisite in the photographs. 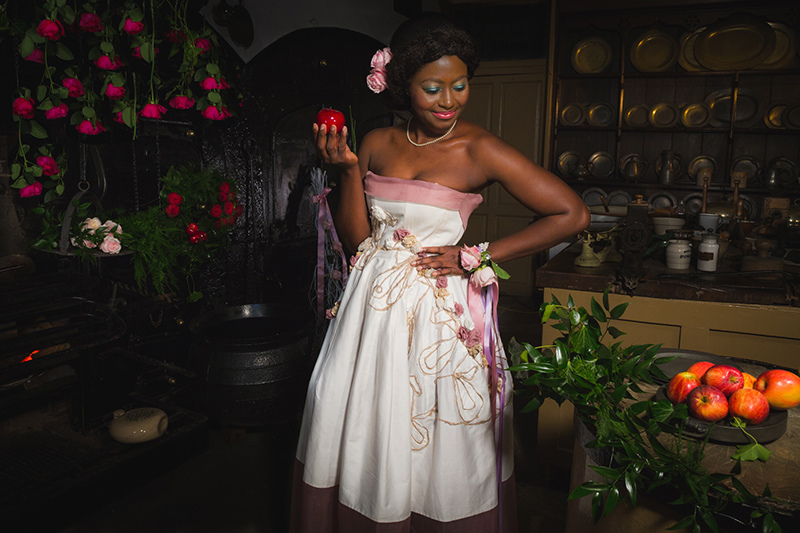 I had an overwhelmingly positive reaction from the designers I approached to lend us dresses. Amanda Wyatt, Lucy Tammam and Elizabeth Stuart loved the Real Princesses concept and gave us the pick of their collections. 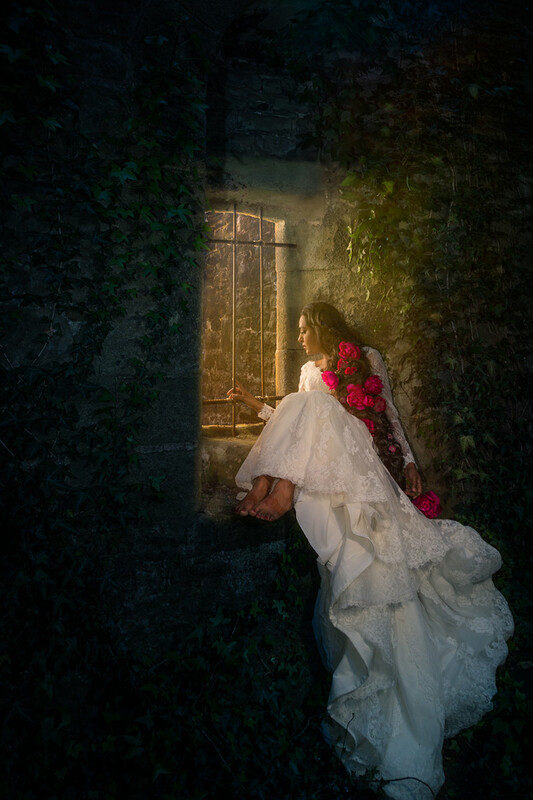 As Sabbi is a UK size 12, and designer samples tend to be size 8-10, I borrowed a dress from Lottie’s Bridalwear in Lytham St Annes for our Rapunzel shoot. The designers, Ellis Bridal were delighted that we featured their gown. Finding venues was more tricky, but after a lot of trawling though Google images I found the perfect locations. 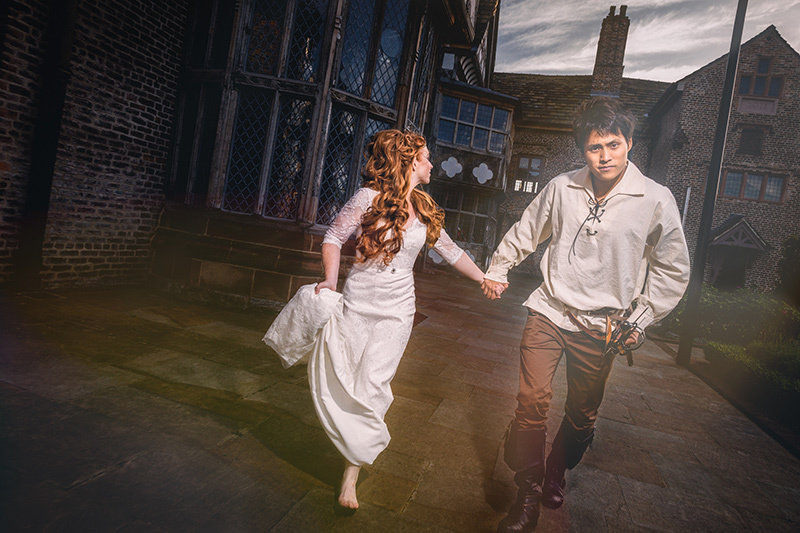 Ordsall Hall is a stone’s throw from our Manchester studio and has a fabulous four-poster bed ideal for Sleeping Beauty. Towneley Hall in Burnley has a wonderful old fashioned kitchen, just right for Snow White’s scene in the dwarves’ cottage. When it came Rapunzel, I really struggled. I was trying to find a tower, but the windows were never the right size. Eventually I stumbled upon Whalley Abbey, which had plenty of huge stone windows. 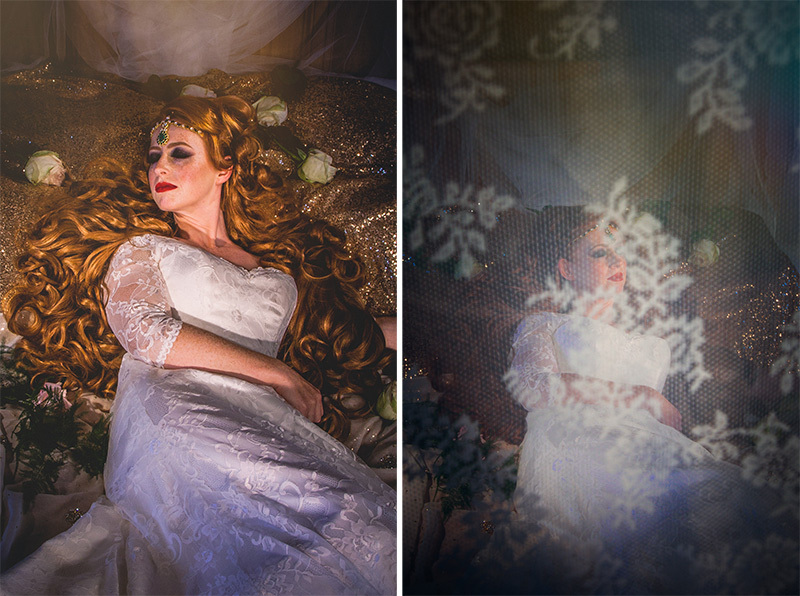 In the end we shot two Rapunzel settings, and I kind of prefer the smaller window, as the ivy gives the scene a very ethereal quality. Carlton Towers in North Yorkshire had such an incredible sweeping staircase that I was determined to shoot Cinderella there. The staff were fantastic and stayed late so we could shoot at night. 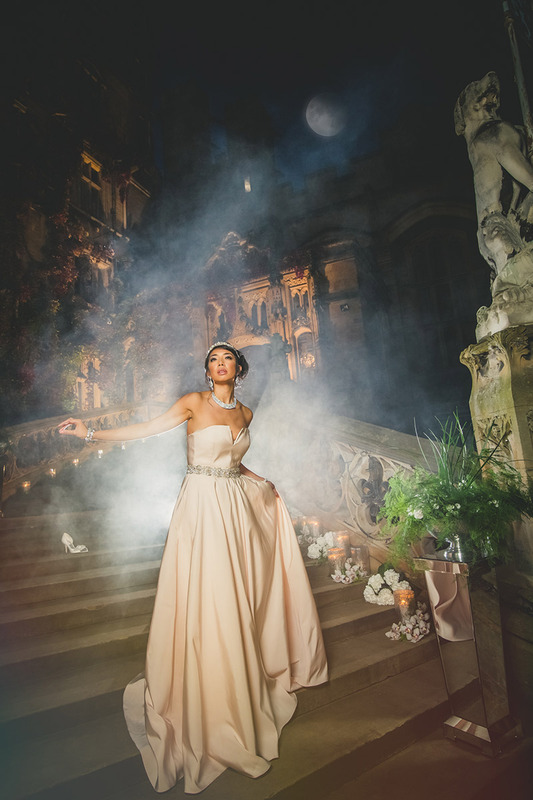 We even hired a smoke machine to create that misty, other-worldly quality. Our assistant Seb looked very comical crouching behind the wall and running out intermittently to swish the smoke machine across the steps! 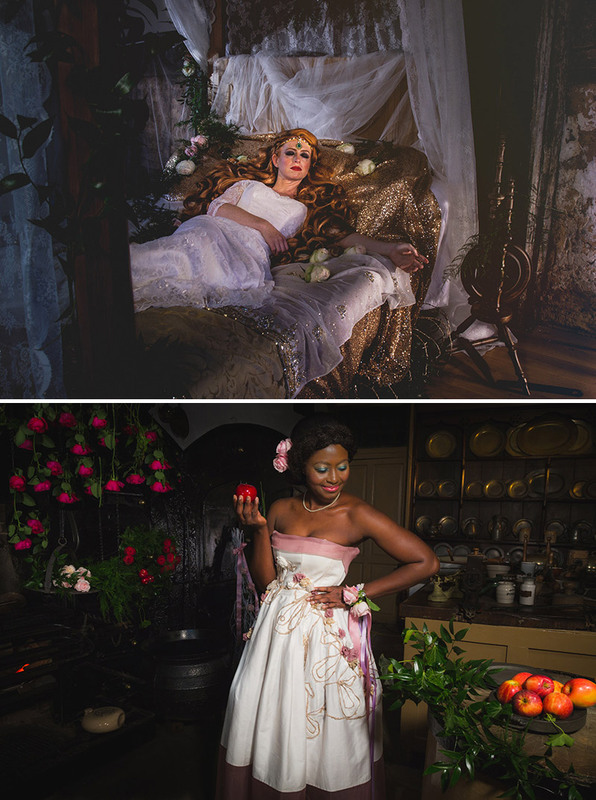 “Real Princesses” has been wedding styled shoot labour of love, over a year in the making and I am really proud of our team. Huge credit goes to my husband Guille Ibanez who was our photographer, working on his first ever styled shoot. We’ve had a lot of positive responses from brides to be and industry professionals, and now we want to spread the message further. Everyone in the world of weddings can do something to make our industry more inclusive. Let’s celebrate the beauty of all women. Because we all deserve to feel like princesses, especially on our wedding day.